Keukenhof II tapestry shows a scene from one of the largest gardens in the world. This huge garden in Holland boasts thousands of tulips, and here we see a scene of red and yellow tulips beside a still lake reflecting the colors of the foliage of the trees in the woods beyond. A combination of planted tulips and wild foliage provides a beautiful balance of natural and cultivated gardens. 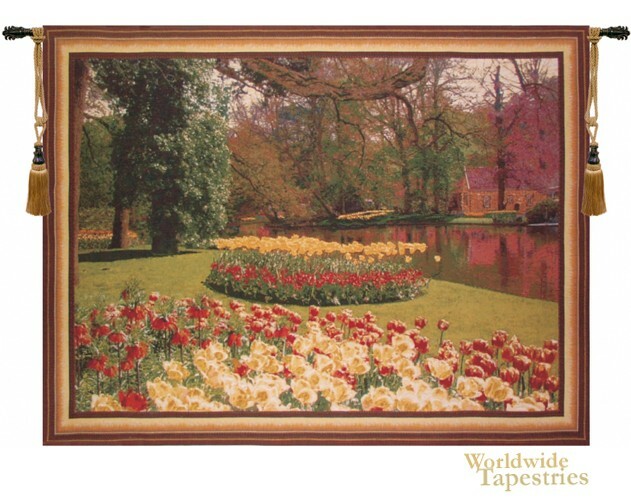 This Kuekenhof II tapestry is backed with lining and tunnel for easy hanging. Note: tapestry rod and tassels, where pictured, are purchased separately. Dimensions: W 40" x H 26"
Dimensions: W 45" x H 33"
Dimensions: W 69" x H 48"